The indoor pool at the historic Millennium Biltmore Hotel, in Downtown Los Angeles is Roman-style, with teakwood deck chairs and cold showers, reminiscent of cruise ships from the 1920s with its original tile and mosaic work. It’s only open til 6pm but there’s so much to explore downtown, you’ll have plenty to do in the evening. Four Seasons, Westlake Village just outside of Los Angeles has an adults-only outdoor pool as well as an indoor pool for all ages. 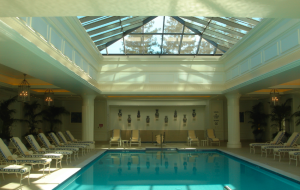 The indoor pool area is covered by skylights so it’s airy, with streaming sunbeams on a nice day, and no dark, dankness to be found. There aren’t too many serious kid amenities, though kids are more than welcome and are frequently spotted here. The resort has a wellness theme so you’ll probably find plenty of lap swimmers and pool exercise enthusiasts as well. The Los Angeles Athletic Club in downtown LA is a unique 125-year-old private club with athletic facilities, restaurants, bars, meeting rooms, even a classic ballroom on the 3rd floor. It’s Los Angeles’ version of the Yale or Harvard club and also includes a hotel with a classic, historic vibe and reasonable rates. The pool is well heated and is mostly used for lap swimming, fitness and scuba lessons, but there is also a small children’s pool. Both are well-heated, indoors, and are available for use by hotel guests. The Long Beach Marriott has both an indoor and an outdoor pool so if the weather is nice, you might not even need to venture inside. 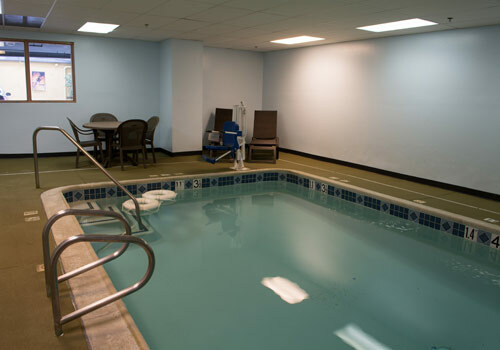 The indoor pool, connected to the fitness center is open 24 hours so if you’re interested in all-night swimming and reasonable room rates, this might be your best option. The Tilt, Universal City is like a motel than a hotel, but this Clarion property in the Cahuenga Pass has a no-frills indoor pool and very reasonable rates.